MLW is back inside the Melrose Ballroom tonight for Battle Riot. 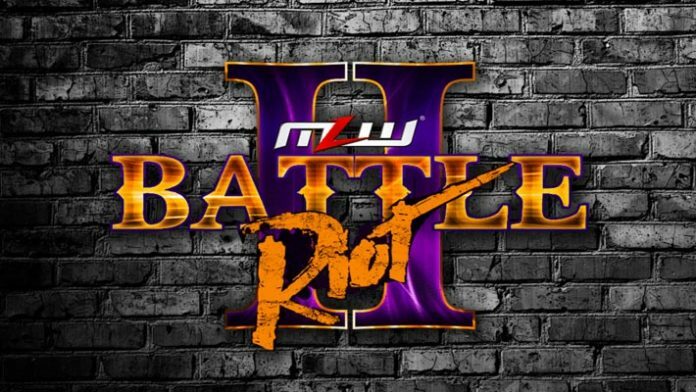 Major League Wrestling will present the 2nd ever Battle Riot event tonight inside New York’s Melrose Ballroom. In what has already become a signature event for the promotion, 40 wrestlers will compete in a no-rules, weapons-legal, battle royal where eliminations occur via pinfall, submission, or being thrown over the top rope. The 2019 Battle Riot will air live tonight on beIN SPORTS from 8PM – 10PM. MLW’s normal Saturday evening timeslot will air a replay tomorrow. Episodes of Fusion are normally added to the promotion’s YouTube channel on Sunday’s at 12 PM. If you are in the area, limited tickets were recently made available. 5 entrants have yet to be confirmed. The winner will receive a shot at the MLW World Championship at a date of their choosing. The promotion has also advertised there will be surprises, WTF entrants, and legends. MLW also held a show last night in Melrose Ballroom. The matches from that event will air on Fusion in the coming weeks. Last year’s Battle Riot winner, Tom Lawlor, would wait until SuperFight earlier this year to cash in his title shot. When he did, however, he defeated Low-Ki inside the 2300 Arena in Philadelphia to take the title. He later defended it inside a steel cage against the former champion in Chicago. Last night, he wrestled Jimmy Havoc in a NYC Street Fight. That match will air on Fusion in the coming weeks. MLW features several factions which are worth noting. The Hart Foundation faction of Davey Boy Smith Jr, Teddy Hart, and Brian Pillman Jr. began their tenure in the promotion as heels but have quickly won over the support of the MLW faithful. Promociones Dorado and the CONTRA Unit are other factions fans might want to keep their eyes on. Salina De La Renta’s Promociones Dorado formerly had the MLW World Championship in their midst but with that gone, the faction is turning to the likes of Ricky Martinez, LA Park and Hijo De LA Park to do Salina’s bidding. She’s targetted Mance Warner as a rival but he might prove to be tougher than she expects. Simon Gotch, Jacob Fatu, and Josef Samael look to have started guerrilla warfare in MLW. Their CONTRA faction caused near-riot conditions last month in Chicago. Battle Riot seems to be a fitting match for them to have success in.